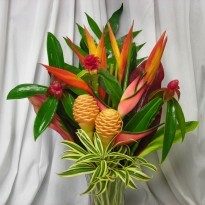 A special bouquet featuring seasonal tropical flowers. 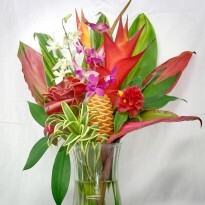 Each arrangement is totally unique… just like Mom! A rainbow of beautiful colors & edible Hawaiian treats. We recommend scheduling your flower order early. 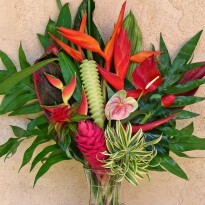 You can order your tropical flowers anytime – just fill in your requested delivery date on the order form when you check out. Your order will then be marked on our calendar to be picked fresh the morning of your order. We will send you a personal email confirmation when your order is placed and send a FedEx tracking number when your flowers ship.